The much-anticipated Tony Romo playing appearance at the alt PGA Tour event at Corales Puntacana Resort & Club Championship ended in less than stellar fashion. He was even thru 12 holes before an unfortunate flurry of +5 over four holes quickly derailed his chances to make the cut. Still as a amateur scratch golfer, its worthy to see how a good stick fares against the true professionals on a Tour setup. We hacks silently wonder how our games would hold up–or unravel–in the presence of crowds and playing strictly by the rules. If a typical pro’s “handicap” is at least +4 or 5 strokes, Romo’s “double hockey sticks” isn’t that surprising. Or being 6 shots outside the cutline. Personally, I think any amateur would be fairly thrilled breaking 80 with all the hype and potential epic fail in a PGA Tour event. Yet, Romo did tie or beat seven Tour pros (four Tour winners, and 1 major). Thus, he was hardly an abject failure. Golfworld.com’ Joel Beall provides the skinny. “Hit two poor tee balls, didn’t commit to it, and ultimately put in a tough spot where you’re just trying to make par,” Romo said after his round. “I hit the ball good today, hit some really good shots, ended up in some poor spots, but you learn the golf course as you play it. 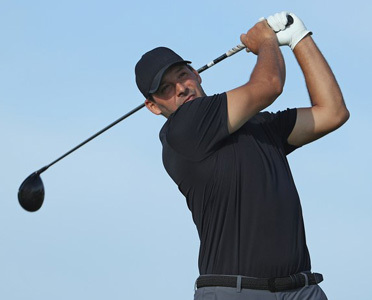 Although Romo, who is playing on a sponsor’s exemption, has the power and iron prowess equivalent to the modern pro, it was his tee-ball accuracy that ultimately did him in on Day 1. Despite some of the biggest landing spaces on tour, the 37-year-old hit just eight fairways. Romo will attempt to rally on Friday, teeing off at 10:00 a.m CDT.